MSG to Outlook conversion, both binary and text MSG files are supported. This purely online MSG conversion service accurately and quickly converts e-mails saved in the MSG format (plus attachments) to PST that you can load to Outlook right off the reel. Importantly the cloud service does not require any third-party software and is very easy to use even for inexperienced users. And your data remain secure thanks to automated conversion and compression of the resulting PST to a hack-proof RAR archive. The service converts your e-mails in the cloud. You can keep working while it does. How to convert MSG files to PST files easily? Many e-mail clients store or export e-mail data as MSG. Some of them are Microsoft Outlook, The Bat!, MS Exchange, and other software. There are two formats behind the MSG file extension, though: binary and text. Binary MSG is a mail message file format supported by Outlook and Exchange. Text MSG is technically an EML file that is simply saved with another extension. Put this shortly, not all MSG files are equal. 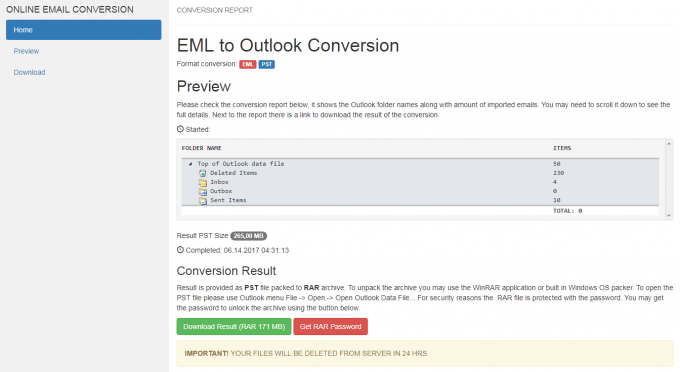 ConvertEmail.Online takes into account differences in MSG formats and provides 100% support for any varieties of MSG files when converting to PST. That’s a huger timesaver, because you don’t need to find out what kind of MSG e-mail files you are dealing with, text or binary. Just feed that file to the cloud service ConvertEmail.Online and let it do all the work for you. First of all, you need to pack MSG files you want to convert to Outlook PST into a single ZIP archive. Many e-mail clients including Outlook and The Bat! support exporting to MSG, so you won’t have much problem finding the resulting MSG files after the export. Then, you need to zip those files into a single archive file using OS built-in capabilities or a third-party tool. ConvertEmail.Online supports several ways to upload data, you can choose the one most convenient to you here. Uploading requires you to verify your e-mail address first. Enter your e-mail address, then wait for the confirmation message and click the link in that message as soon as you receive it. The email confirmation step is required, because the result of MST to PST conversion will be sent to your e-mail. Specifically, the service sends a link to the conversion report page. And this page is only available if you know the link, so that is why you need a correct e-mail address. After you upload the zipped MSG to the cloud conversion service, it starts transferring your data to the PST format. Don’t worry, your data stay absolutely secure and private – the process is automatic and no human eyes will ever see your information. When you receive the link to the report, you can now download your PST file auto-converted from the MSG email data you have submitted. On the report page you should see two buttons. The “Download” button allows you to download PST compressed to RAR. The second button, “Get password” provides you with the password required to open the RAR archive. Not e that the archive is password-protected to prevent information leaks and add an additional layer of security to your data. If the resulting PST file is below 100 MB, you can get the password to the RAR archive for free. Simply click the “Get password” button and receive the password instantly. Otherwise, the cost is $1 per GB plus $4.95. Not that much provided the service saves you hours you would spend on manual conversion and even fixes encodings, glitches and discrepancies found in the source MSG files.